Networking for introverts should not be daunting. In fact, if you are an introvert, you have an advantage. You are already probably described as a great listener! Half of networking is listening. The other half is directing what you hear into how you can help. Customer service is an attitude that applies in even networking situations! The reason being that you are a problem solver. You start with your story. You make your journey relatable. Why did you start caring about this problem? Tell us about the journey. Most people bring an “elevator speech” to the table. That’s a bunch of sales points about what you are doing and why with a popping out of the business card (which should always be on hand). But do people relate to sales points or to stories? Humanize the process by being you! That’s the first step. 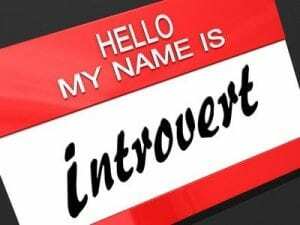 Now, lets get into how networking for introverts can be an easily navigated adventure. Cocktail party rule- Share your content and others’s content. Don’t hog the limelight! Find professionals and organizations that share similar values. Respond to people on any forum. Build relationships. Networking is about relationships. Building rapport in this context is faster and smoother and therefore, you are engaging with more people at once at twitter Find similar causes, similar sentiments, etc. Build your value with those that you network with through commenting on their content as well. Point out their product’s values. Trade. 2) Listening As an introvert, you’ve already got this down. Now, here is a body language move. When you are at a loss for words (say you blank or anxiety sets in), raise your eyebrows as though you are waiting to hear more. Look directly in their eyes. But in all seriousness, what happens to introverts is that because they are fearful of pauses or silence, they either a) talk too much or b) talk too little. It’s an interesting phenomenon. That’s right though. Sometimes, introverts talk more! Did you know that social anxiety is something that people hide through creating a persona? Rather than doing so, you want to stay our authentic self. You are not entertainment. You are not there to be a wallflower and let others do the networking. Rather, you are there to listen. Go and listen to the most people’s stories. With this new attitude in mind, the navigation through networking should seem less daunting. 3) Connect. You know what gets you talking? PASSIONS. If you are not excited about a gathering, about what the other person is doing, then share your passion. But here’s the catch. We can’t make this all about you. It’s either a trade or it isn’t. Note: In networking, there is always some form of trade. That means that if you start sharing your passions, ask for input. Value input! Discuss how the other person could benefit from what you are doing. If you truly struggle with asking questions that relate to what another person is involved in, ask instead-does this interest you? Why or why not? Redirect your open ended questions to be about how your efforts can help the person in front of you. You are a problem solver, story teller and listener. 5) Elevator speech– This is a speech you should have ready at events/networking gathering. It’s who you are, what you do, why you are doing it, how you are doing…here’s a great way to remember. If you have ever taken journalism, you know how it starts, right? Who, what, when, where, why and how. And as a professor once stated, “Keep it simple, stupid!” Great! Now, did the other person just give their elevator speech. Did you keep track of their what, when, etc? Oh, wait, they didn’t mention the “how!” There’s your firstnetworking question. Onto the networking….